Club Carlson is at it again, with another promotion that will run through September 30, 2012. 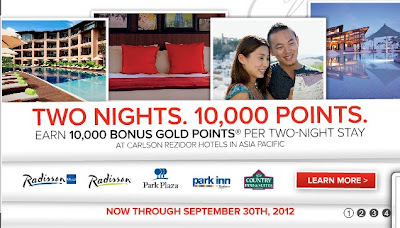 You can earn 10,000 bonus points with every two consecutive night stay at Carlson Rezidor Asia Pacific hotels. Register for this promotion with your Club Carlson membership number. The “Two Nights. 10,000 Points.” Promotion (“Promotion”) is only available for Club CarlsonSM members for Eligible Stays at Radisson Blu, Radisson, Radisson®, Country Inns & Suites By CarlsonSM, Park Inn by Radisson and Park Plaza® hotels in Asia Pacific (“Participating Hotels ”). To enroll as a Club Carlson member, please visit www.clubcarlson.com.The Promotion is subject to all Club Carlson program rules and conditions (“Program Rules”). Members who register online for the Promotion at clubcarlson.com/10000points (“Registration”), provide their Club Carlson member number at the time of reservation or check-in, and pay for their stay will earn 10,000 bonus Gold Points® (“Bonus Points”) per Eligible Stay. An “Eligible Stay” is a stay of two or more consecutive nights on a Gold Points eligible rate at a Participating Hotel, regardless of the number of check-ins or check-outs during the stay, beginning on or after July 17, 2012 and completed September 30, 2012 (“Promotional Period”). Both the check-in and check-out dates of the Eligible Stay must take place within the Promotional Period. Bonus Points are in addition to the standard 20 points per U.S. Dollar spent earned for the Eligible Stay. Bonus Points are awarded on a per stay basis for each Eligible Stay regardless of the total number of nights stayed. There is no limit on the number of Eligible Stays each Club Carlson member can complete during the Promotional Period. Bonus Points and standard points are only awarded on Gold Point eligible stays and regular eligibility rate rules apply. Only one Club Carlson account may be credited with Bonus Points for each Eligible Stay and the same Club Carlson account must be used for corresponding standard points (if applicable). Allow 6-8 weeks for bonus Gold Points to post to your account. Elite member bonus points and other bonus point earnings do not apply to, or qualify for, Bonus Points awarded under this Promotion. Members only need to complete Registration in advance of check-in, or prior to check-out for their first Eligible stay and do not need to register for subsequent Eligible Stays. In connection with the Registration, Club Carlson is not responsible for interrupted or unavailable network, server, or other connections miscommunications, failed telephone or computer hardware or software or telephone transmissions or technical failures, Internet Service Provider/network/website inaccessibility or unavailability, garbled or jumbled transmissions or other errors of any kind, whether human, mechanical, or electronic; including without limitation the incomplete, incorrect, or inaccurate capture of Registration information. Room rates do not include state/local taxes and may vary for each night of the Eligible Stay. This Promotion may not be used in conjunction with any other package, promotion, discounts or bonus points programmes. Participating Hotels are subject to change without notice. A limited number of rooms may be available for this Promotion and the Promotion is subject to room availability. To the fullest extent permissible by law, Carlson Hotels, Inc. reserves the right to amend, add, modify, or discontinue Promotion at any time without notice. Void where prohibited by law. By participating in this Promotion, you agree, accept and consent to these terms and conditions.